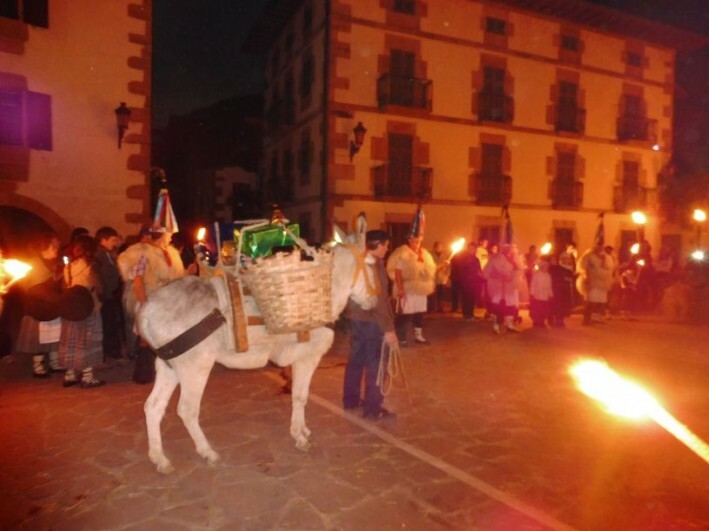 As you would expect even Basque Christmas traditions dig deep into their pagan past. Here, during the winter months, the flint-grey skies linger over the Baztan Valley while the ember-red autumn leaves burn out slowly and silently on the forest floor. Even the mighty autumn winds, which have hunters darting for their guns in October, have run out of breath and are too lazy to scatter the leaves in their wake. The mood is changing, winter is approaching, and its dark, steely, misty nights slowly throttle village after village in the Basque Pyrenees. This is the time of dread, and the moment when Olentzero, the only survivor from the times of the giant Jentillak of Lesaka, comes down from the mountains. He is a man of strange appearance, his hair is wiry and straw-like, virtually fossilized under his Txapela (Basque beret). He has open, way-worn eyes and a straggly, unkempt beard. His face is haggard and tanned from its exposure to the charcoal he burns and his fingers are gnarled and knobbly. 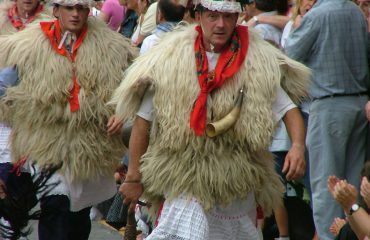 The Atorra (Basque shirt) he wears is musty and foul-smelling. Olentzero gets down from his Pottoka (semi-wild horses that roam the Basque mountains) and his Abarkak (shoes) crunch through the crisp leaves detonating tiny displays of fire-crackers at each step. Something special is about to begin the forest is crisp and tense. As the story goes, Olentzero, the charcoal maker, used to tour the Basque villages with his sickle, beheading those who ate too much on Christmas Eve. (However, these gruesome acts seemed to do little to dampen his own appetite for food and drink for he was known, paradoxically, for his gluttony and drunken ways, feasting on rich meats and strong local liqueurs – usually Patxaran, the Basque liqueur made with sloe berries and aniseed). With the Christianization of the Basque lands, Olentzero’s personality no longer fitted with Christian values and those personality traits considered too pagan were removed. Today’s Basque Christmas traditions portray Olentzero as a self-effacing and humble man with a kind and generous heart who carves wooden animals, toys and dolls. Once he has filled his big charcoal sack with toys he hikes down to the village in the valley to hand out the wooden figures amongst the children. One day he came down to the village to find a house in flames and immediately ran into the house to save the children. Having saved everyone he was just about to save himself when the roof collapsed and buried him. As the people from the village gathered outside the burning ruins they witnessed a white flash leaving the flames, darting upwards and heavenwards. Apparently the fairy that had raised him in the woods had come to save him saying: “Olentzero you have such a good heart, you even gave your life for others. You should not die. 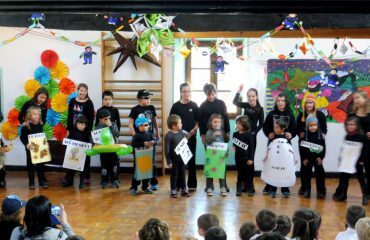 You shall live forever, making toys and other presents for all the children in this village and in the whole Basque country.” And that is how the story is told today, every 24th December, when Olentzero stars in the Basque Christmas traditions in every Basque Country town. The word “olentzero” is the combination of two words : olesen and aroa which gives us an indication of the figure’s significance: “aroa” means “time” or “season”. “Oles” means to “call” or “ask”. 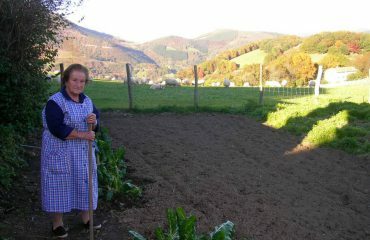 Now, despite attempts to eradicate all Basque traditions during Franco’s dictatorship, Olentzero is a popular character in all Basque villages. 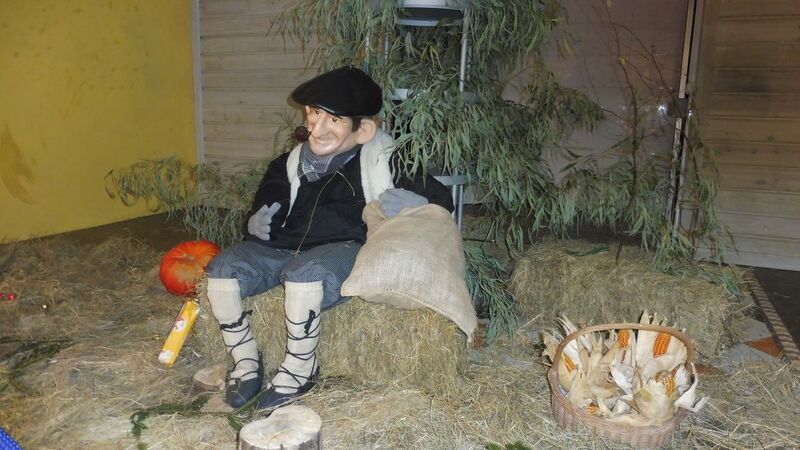 He visits almost every village of the Basque provinces, often by cart or wagon, or leading a donkey laiden with presents and is represented as a fat jolly peasant with his wide-brimmed black Txapela, puffing a pipe and – not atypically and most probably to his great relief – still surrounded by copious quantities of food and wine! 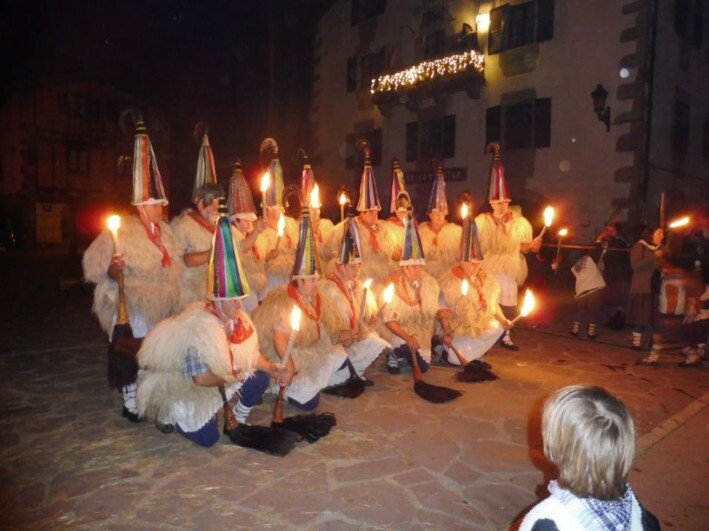 In Ituren Christmas Eve is a dazzling mix of pagan and Christian – the Joaldunak, bells on their back and sheepskins around their waist, light flares in the darkness and march in solemn file out from the plaza, followed by a throng of excited villagers and children dressed in their traditional peasant clothing. The procession heads out to find Olentzero waiting up in the hills on the outskirts of the village and then accompanies him, and his donkey, laden with presents, back to the village square. 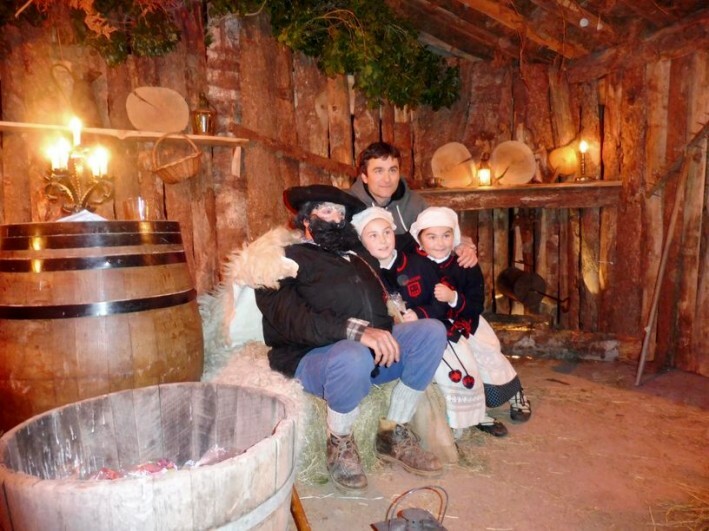 As Olentzero passes through the village he showers the children with sweets before taking his seat in the middle of a life-sized nativity scene which – on rainy evenings – is conveniently situated under the arches of the village bar!